Vision: Connecting people through cultural understanding, artistic expression, and rhythmic heartbeat. Mission: San Jose Taiko is committed to advancing the taiko art form by evolving and raising the visibility of SJT's unique style and philosophy around the world. San Jose Taiko approaches taiko as a path to social action, community development, cultural preservation, and Asian American identity. This connection was particularly important for early members of San Jose Taiko—third generation Japanese Americans whose parents had experienced Internment during WWII. These young people were dealing with the ways Internment affected them economically and defined them as something other than American. Taiko provided a way to express both their Japanese roots and their American-ness. SJT’s strength and longevity lie in the accessibility of our music and artistry, appealing to something on the basic human level in all of us. Through taiko, we encourage cultural pluralism as a gateway to better communication, open­-mindedness, and connection, unifying communities and empowering individuals to promote a more just world. SJT is a professional performing arts company that tours internationally and provides hundreds of local performances each year. Through the Taiko Conservatory, SJT members lead classes for youth, adults, and seniors. A full-time Artistic Director provides artistic vision and leadership for the company, and every member has the opportunity to provide input into artistic decisions and ensemble direction. A full-time Executive Director oversees the organization as a whole, handling administration, planning, fundraising, and other organizational matters. 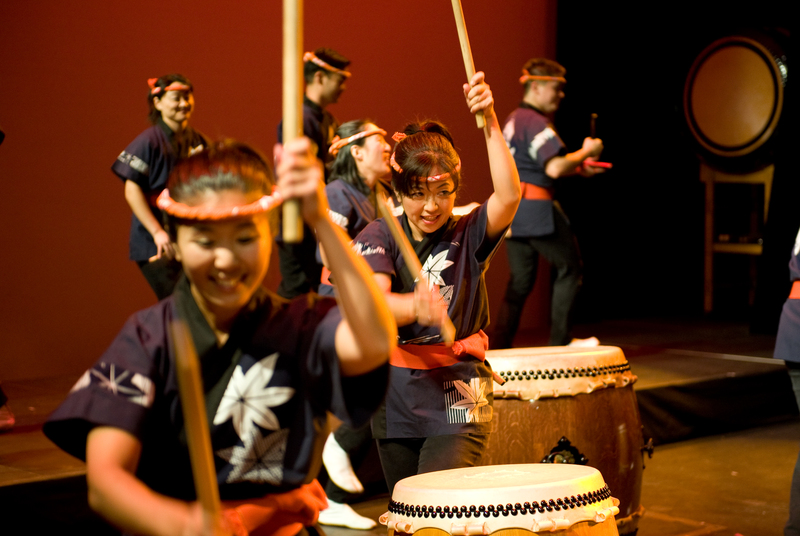 For San Jose Taiko, Attitude is the necessary mental aspect of the taiko art form. Primary elements are respect and discipline, although they are not the only elements. The group operates under a comprehensive concept of respect that includes respect of one’s self, other players, the instruments and other equipment, practice space, history, audiences, etc. They see discipline of body and mind and beginner’s mind as critical foundations for artistic competency. San Jose Taiko defines Ki as the life force energy that connects all things. San Jose Taiko believes that this intangible energy can be heard in their playing and seen in their Kata. Often described as the emotional and spiritual aspect of the San Jose Taiko philosophy, Ki is a way players can achieve oneness with the drum, other performers, and even their audience (6). New performers join San Jose Taiko through the Audition Process (AP). A new AP class begins in January each year and lasts two years. Evaluations take place roughy every quarter. AP students may quit the process at any time, and may be cut at any evaluation point. The first year of AP is basic training, fundamentals of SJT kata, musical technique and ki. It also includes a study of the history of taiko in Japan and in the US. The second year is an apprenticeship year that includes community performances with the performing company. At the end of two years, those students who have made satisfactory progress are invited to become Performing Members. In the past 5 years, AP classes have averaged 5-8 students, with 1-2 students passing all phases of their evaluation and joining the company at the end of the second year. Apprentices work hard to master all San Jose Taiko repertoire and the finer points of SJT musicality and kata as quickly as possible. The more senior members of the group provide an enormous amount of support and assistance to the Apprentices in this process. San Jose Taiko performing members are expected to attend practices 2-3 times weekly, help maintain equipment, teach at the SJT Conservatory, and participate in a minimum number of performances each year. 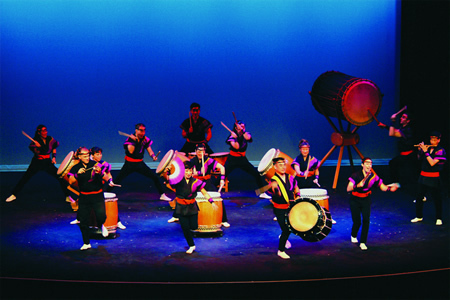 San Jose Taiko, founded in 1973, is one of the first three taiko groups established in the United States. San Jose Taiko started as a project of the San Jose Buddhist Church, when Reverend Hiroshi Abiko was inspired by Kinnara Taiko— then a new taiko group connected to the Senshin Buddhist Temple in Los Angeles— to form a taiko group for young people in his church. Reverend Abiko recruited Roy Hirabayashi and Dean Miyakusu to launch the group. In what would later become normal practice for new taiko groups, San Jose Taiko constructed its own drums. Their first performance was in October 1973. As interest in the greater Japantown community grew, SJT became a community group providing an artistic voice to express the Japanese American experience. Thanks to membership that included accomplished musicians, the group quickly developed exciting original repertoire with an eclectic and worldly edge. San Jose Taiko members are more than performers; they contribute to the longevity of the organization. Each member dedicates 5 to 15 hours each week to rehearse, perform, and teach SJT's many workshops and classes. The awards and recognition given to San Jose Taiko are shared with all performing members, past and present. Bios and headshots of current performers can be found here. The members of San Jose Taiko range in experience from 30+ years to 6 years, and come from all ethnic backgrounds and occupations Most, but not all, are Asian-American and most, but not all, are from California and between the ages of 24-50. Member motivations for playing are equally diverse, although nearly all members cite sharing their love of taiko and bringing joy to audiences as a reason for being part of the group. There is no one musical background that all members share, although many played taiko in their collegiate groups. Description of the group's community - regional, ethnic, social, etc. 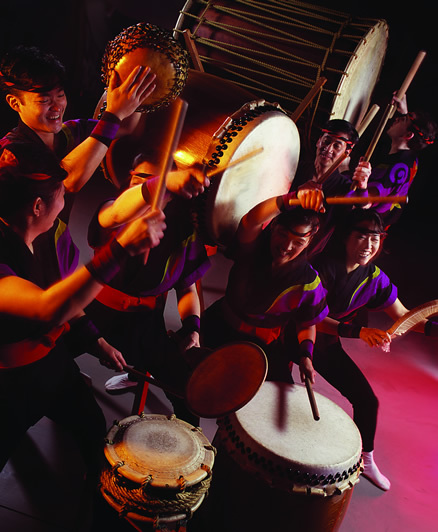 San Jose Taiko is dedicated to serving a diverse range of local, regional, national, and international communities by providing vibrant and innovative performance, outreach, and training programs. These programs engage youth and adults regardless of age, gender, and ethnicity. The group is based in, and an important ambassador for, the historic San Jose Japantown, one of three remaining Japantowns in California. SJT is fortunate to have offices in the Issei Memorial Building, an important landmark in the area. With 45 years of history, it would almost be easier to list the taiko greats who haven't taught, instructed, mentored, or otherwise helped shape SJT. Inside-Out and Outside-In: Participant Observation in Taiko Drumming. By Powell K. In: Hammond L & Spindler G. (eds) In: Innovations in Educational Ethnography: Theory, Methods, and Results, Lawrence Erlbaum & Assoc. 2006. Festivals Taiko is often showcased at matsuri , or festivals, held during special seasons in Asian American communities. In fact, the growth of the art form owes much to the visibility that taiko groups have enjoyed at these celebrations. San Jose Taiko gladly participates in these local events, as well as at multicultural and music/dance festivals, state fairs, and city celebrations throughout the country. Full Concerts and Home Season Concert San Jose Taiko showcases their rich repertoire in a 90-minute concert set with creative staging and lighting design. Concert venues vary in size from small stages to large theaters at schools, colleges, universities, and performing arts centers. A major annual event for San Jose Taiko is our home season concert , an extended series that provides an opportunity to premiere new compositions, try new programming concepts, debut new performing members , and share special time with our dedicated and supportive local audience. Tours and Residencies Touring generally takes San Jose Taiko on the road for three to five weeks during the Spring and again during the Fall. Bookings are contracted through our agent, Holden & Arts Associates , Inc. and are in various regions of the United States as well as abroad. While on tour, the company performs concerts and conducts residencies, which last from three to seven days and include a combination of full concerts, school programs, and master classes. Collaborations To increase artistic strength, share in a variety of creative processes, create a diverse network of fellow performing artists, and reach new audiences, San Jose Taiko frequently participates in collaborations that cut across artistic disciplines. Working with an open mind and open heart, San Jose Taiko strives to expand, extend, and enhance the boundaries of kumidaiko. San Jose Taiko is a prolific group, with members having composed and arranged nearly 100 original songs, with choreography, over the decades. Below is a list of the best-known and/or most regularly played; it is not, however a full list of all SJT works. Yorokobi Taiko, by Steve Yamaguma, 1974. Translating as "Happy Drums," this piece is an up-tempo polyrhythmic composition that demonstrates the lighter feel of the taiko. Fuurin Kazan, by Steve Yamaguma, 1975. The song is based on the images of the wind, forest, fire and mountains. Using polyrhythms and a driving base rhythm pattern, the song takes you through the different images of nature. Gendai ni Ikiru (Living in the Present), by Gary Tsujimoto, 1978. “Living in the Present” reflects the blending of traditional and modern rhythms to create a sound that combines a simple taiko beat with rhythm patterns of jazz. Seven Lands, by Jose Alarcon, 1980. Although the seven continents are separated by seven seas, the sounds of taiko can travel over waters to reunite these lands. Oedo Bayashi, by Gary Tsujimoto, 1983. Inspired by the dynamic style created by Seido Kobayashi of Oedo Sukeroku Taiko (Tokyo, Japan), this piece features the performers in a driving series of movements and improvised solos. Hachijo Taiko (arrangement by PJ & Roy Hirabayashi), 1983. The basic rhythm patterns were taken from the style of drumming performed on the Japanese island of Hachijo. This piece is played on one drum and features two soloists in a weaving melody. Free Spirit, by Roy Hirabayashi, 1983. This piece features four drummers playing together, against each other, and as soloists. A simple base rhythm moves the piece through variations of the main theme as interpreted by the individual players. One World, by Gary Tsujimoto, 1986. The musicians share a combination of drums, creating a sound that is based on a fusion of African, Latin, and Japanese rhythms. Accompanying them are three instruments from other world music cultures. Insight Through Sound, by Roy Hirabayashi, 1990. Taiko is a visual art as well as a musical form. This composition uses the uchiwa daiko (fan drum) to create formations, shapes, and sounds; and was initially inspired by the work of Timothy Near of the San Jose Repertory Theatre and her work with San Jose Taiko in Oedipus the King. Hitomi Ikuma assisted in the choreography and movement of the piece. Nana-Shi, by Roy Hirabayashi, 1992. Based upon a 7/4 time signature, the piece challenges the drummers in timing and skill. Nana-shi has two meanings: Nana means seven and shi is four in Japanese, creating 7/4. Nanashi in Japanese also means nameless. Kagami, by Anna Lin, 1993 Spirit of Adventure, by Roy Hirabayashi, 1993. 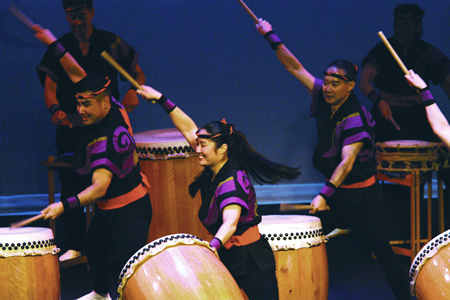 Kagami is a technically challenging piece that merges the styles of Miyarabi Taiko of Tokyo and San Jose Taiko. The faces of the drums are turned toward each other and reflect the player’s connection to the taiko. RumbaKo, by Janet Koike & Toni Yagami, 1993. Cuba and Japan are two very different island cultures, each with its own distinct drumming history. These countries are the inspiration for RumbaKo, which includes rhythms and instruments from both cultures. This arrangement includes the additional flavor of Brazilian Samba. Ei Ja Nai Ka? ("Isn't it good? ), by PJ Hirabayashi, 1994. The inspiration for Ei Ja Nai Ka? (EJNK) came from the high energy of Japanese festivals and folk dances. EJNK is dedicated to the issei, the first Japanese immigrants, and celebrates Japanese American history through movements that reflect the issei’s jobs in agriculture, mining, and railroad construction. Hayaku, by Jeremy Nishihara, 1994. This song, a display of speed and energy, was written with the concept of a driving force that rides but does not exceed the limits of control. Iruka, by Franco Imperial, 2001. This piece charts a journey of an iruka (dolphin) and was inspired by the sensation of traveling along the surface of a vast ocean. Musical and visual themes were inspired by elements of water and the beings that reside in it. San Jose Bayashi, by Matt Ogawa, 2002. This piece, split into three parts, illustrates immigration, rebuilding, and integration. San Jose Bayashi celebrates San Jose Taiko’s home - San Jose Japantown. DoR, by Franco Imperial, 2007. DoR (Day of Remembrance) commemorates the signing of Executive Order 9066, which forced 120,000 Japanese Americans into internment camps during World War II. This song reflects on San Jose Taiko’s participation in Day of Remembrance and celebrates the positive way communities can support each other in the midst of prejudice and cultural misunderstanding. Left to my Own Devices, by Adam Weiner, 2016. Wagamama, by Yurika Chiba, 2016. SoreSamba, by Franco Imperial, 2016. Umi E, by Alex Hudson, 2016. Early Birds, by Dylan Solomon, 2016.